Championship-bound Newcastle United and Middlesbrough will begin next season's League Cup in the second round after receiving a first-round bye. Uefa decided against extra Europa League places for English clubs and as a result the highest ranked first round teams were fast-tracked into round two. 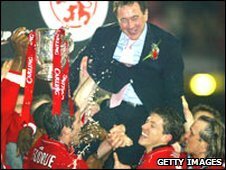 Middlesbrough were Carling Cup winners as recently as 2004, beating Bolton 2-1 at Cardiff's Millennium Stadium. Newcastle were 1976 finalists, losing 2-1 to Manchester City at Wembley.